A boy named Maxon wakes up in a cluttered room looking for her mother. A noise woke him. Mom isn’t responding. Maxon hears gun fire, and then a blast comes through the window. She runs to the mother’s room and finds a facehugger has taken the woman. Pulling the glass from his face, Maxon sees the tail of the parasite whip around and then the bug falls to the floor. Mom wakes up, gasping – neither of them know what the creature is. They hear an explosion outside, there’s obviously a battle raging outside and they don’t know why. The Weyland-Yutani terminal in their apartment warns them of a ‘code yellow’ and gives instructions to get to emergency coordination zone 5. The spaceships they saw leave out their window where the evacuation shuttles. Maxon is told to pack his bags, they need to leave immediately. He pushes back, but eventually gives in. As they flee, stepping over corpses on their way, they come face to face with an alien… but it doesn’t attack. They run passing more ‘dead’ facehuggers on their way, eventually making it to the garage and their car. 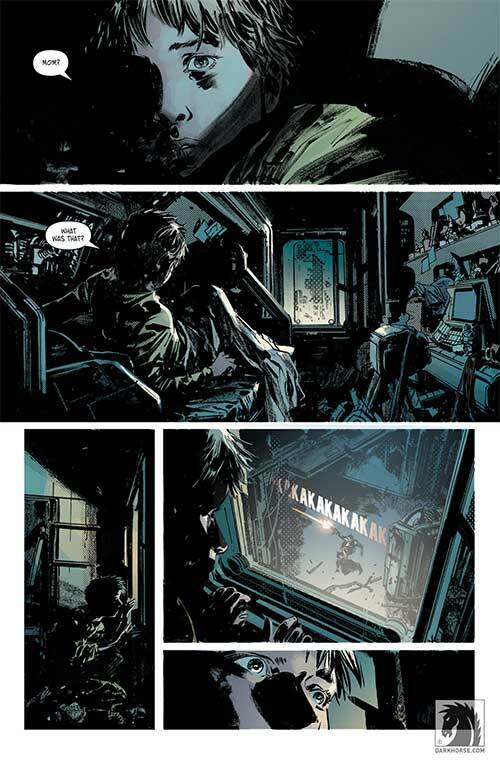 As they drive through town, aliens attacking people just outside their windows, they blow a tire. Something is wrong with Maxon’s mom, he knows it. Bugs start climbing on top of their car, and then they’re hit by another vehicle careening through the streets. The man who hit them is Assistant Administrator Waugh, he gets them out of the wreckage and urges them to follow him a few blocks to the port. 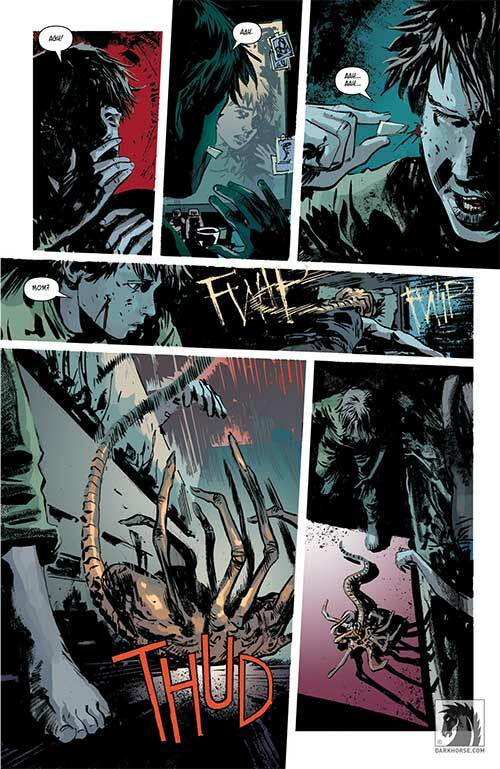 Hardman’s latest Aliens effort (he did Aliens Vampirella in 2015/2016) is, in a word, intense. It opens with a bang and absolutely does not letup, not even on the last page. And on top of that? We know things are going to get worse, at least for mom. They have to, right? 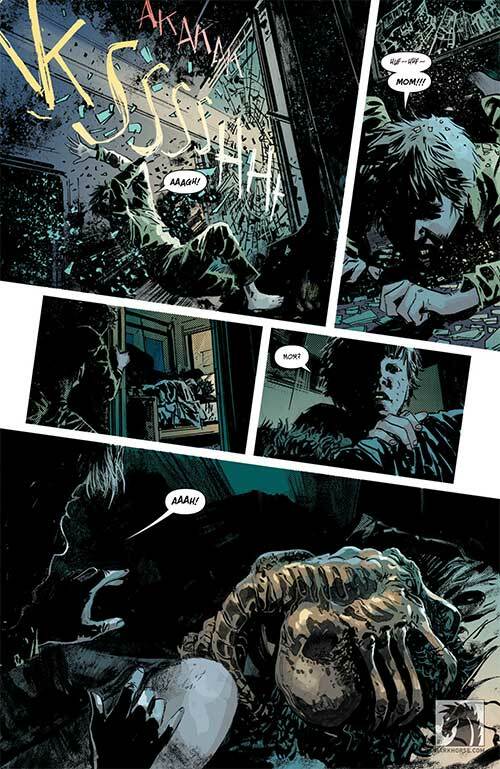 This will likely turn out to be Maxon’s story, but for now, the first issue of this four issue series is all about the action and the horror. It’s almost post-apocalyptic in scale, the artwork showing mass carnage on a huge level. Rain Beredo’s coloring helps bring all of this to life, lots of dark colors are used as this all takes place in the middle of the night, but we get nice contrast with some brighter tones used for fire, lighting and what not. 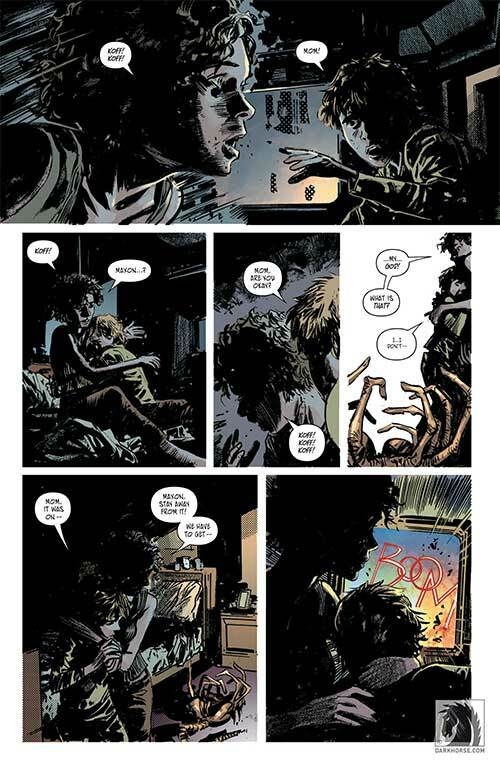 The book has a gritty, dire look to it that works perfectly in the context of the story being told. The city is burning and its inhabitants scurrying to the evac shuttles as best they can, aliens all around them – it’s frightening stuff. We don’t know what’s caused it yet but the mystery behind that keeps the book interesting. Just like its central characters, we want to know what’s going on. 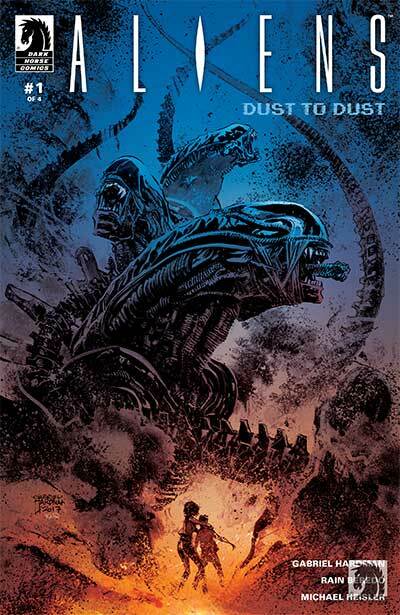 A book as tightly illustrated as it is written, the first issue of Aliens: Dust To Dust looks to be the beginning of great things to come.